Rebecca Nurse was a 71-year-old grandmother and wife of a local artisan when she was accused of witchcraft during the Salem Witch Trials. Nurse was also the sister of accused witches, Mary Easty and Sarah Cloyce, and the daughter of suspected witch Joanna Blessing Towne. Born in Yarmouth, England in 1621 to William Towne and Joanna Blessing, her entire family immigrated to the Massachusetts Bay Colony sometime between the years 1638 and 1640. Rebecca married Francis Nurse in 1640 and raised a family of eight children on a farm in Salem Village. 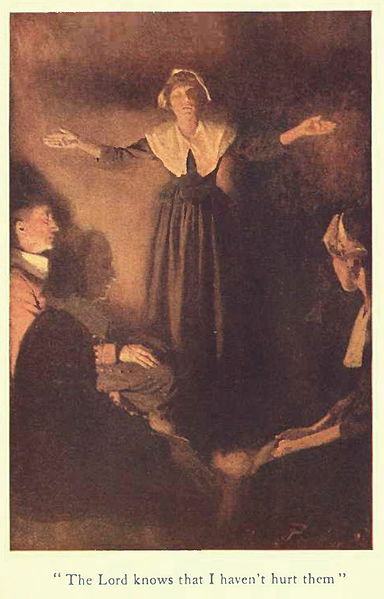 Rebecca Nurse’s arrest on March 24, 1692 came as a complete surprise to the citizens of Salem because she was considered such a pious and upstanding citizen. 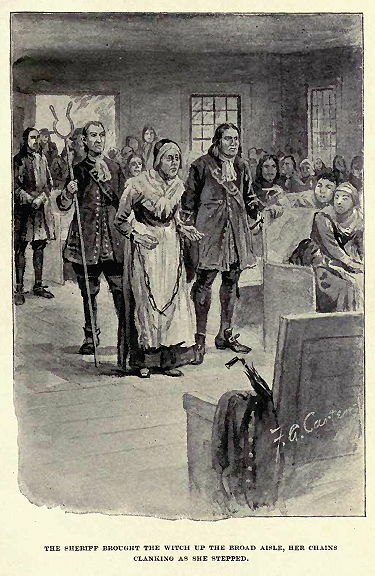 Nurse was accused of witchcraft by Ann Putnam, Jr, Ann Putnam, Sr, and Abigail Williams of Salem village, as well as several others, including Reverend Deodat Lawson of Boston, who claimed to have seen Nurse’s spirit tormenting Ann Putnam, Sr., at her home that March. Many historians believe that the Putnam family was behind the accusations against Nurse. All of Rebecca Nurses’ accusers, including Abigail Williams, Ann Putnam, Jr., Ann Putnam, Sr., Edward Putnam, Thomas Putnam, Henry Kenney, Mary Walcott, and Elizabeth Hubbard were either Putnam family members or friends of the family. Since many Salem residents who criticized the witch trials and the people involved were often accused of being witches themselves, Nurse’s criticism made her even more of a target. At the end of her trial in June of 1692, Nurse was found not guilty by the jury. The verdict was not surprising as Nurse was well-liked in Salem and 39 people had risked their lives to sign a petition in support of her. This so-called incriminating statement refers to when Nurse called accused witch Goody Hobbs “one of us” during her trial. Although Nurse didn’t respond when questioned about it in court, after the trial Nurse wrote a statement explaining that she only meant Hobbs was a fellow prisoner, not a fellow witch. The statements had no effect on the court’s decision and Nurse was hanged at Proctor’s Ledge on July 19, along with Sarah Good, Elizabeth Howe, Susannah Martin and Sarah Wildes. According to local legend, Nurse’s son, Benjamin, secretly rowed a boat after nightfall to the execution site to claim his mother’s body so he could give her a Christian burial at her home. According to the book Women in Early America, Nurse’s conviction and execution marked the beginning of the end of the Salem Witch Trials. The citizens of Salem doubted that such a pious woman could be guilty of witchcraft. This made them wonder if any of the other accused witches were possibly innocent. The accusations continued throughout the spring and into the summer but opposition to the trials began to grow. By the autumn, the court banned the use of spectral evidence in trial, rendering most of the accusations baseless and eventually brought the trials to an end in 1693. 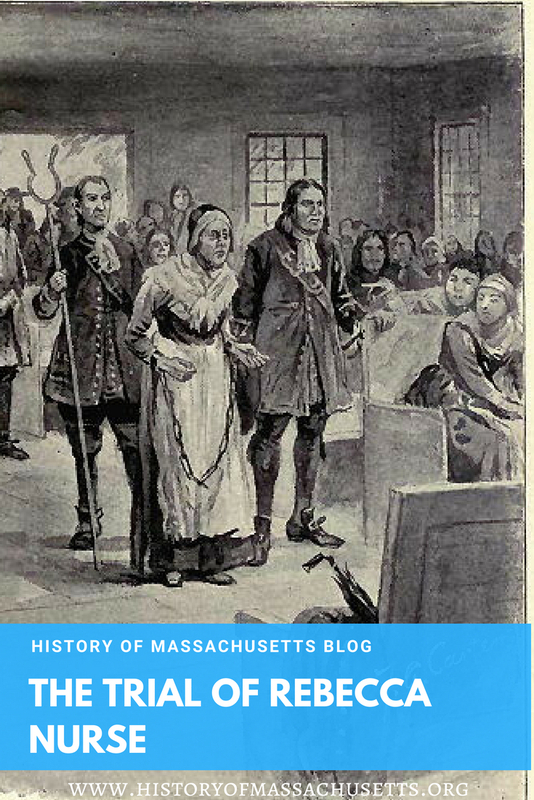 On October 17, 1711, the Massachusetts legislature passed a bill restoring some of the names of the Salem Witch Trials victims, including Rebecca Nurse. On December 17, 1711, the General Court awarded the Nurse family £25 in restitution for Rebecca’s wrongful conviction and death. In 1909, Rebecca Nurse’s home in Danvers, Mass was purchased by the Rebecca Nurse Memorial Association and opened to the public as a historic house museum. In 1992, the Salem Witch Trials Memorial was built in Salem, Mass and a marker was established for Rebecca Nurse. 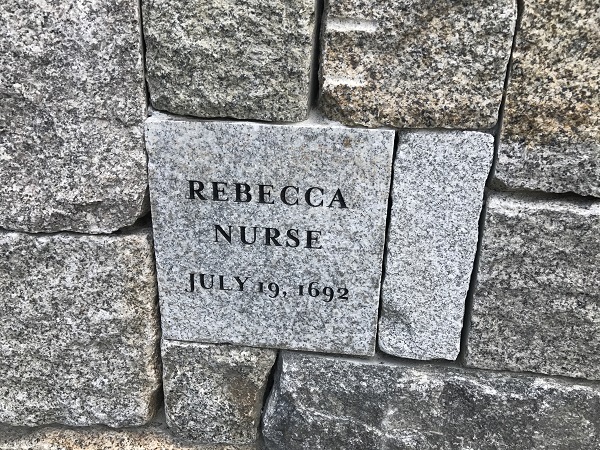 In 2017, the Proctor’s Ledge Memorial was built in Salem, Mass and a marker was established for Rebecca Nurse. 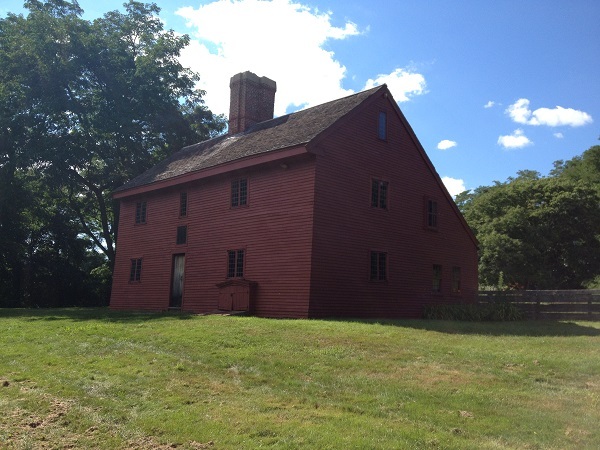 The Rebecca Nurse homestead is still a museum. Also located at the homestead is the Nurse family cemetery and a replica of the Salem Village Meetinghouse. Fowler, Samuel P. An Account of the Life, Character, & c. of Reverend Samuel Parris. 1857. Roach, Marilynne K. The Salem Witch Trials: A Day-By-Day Chronicle of a Community Under Siege. Taylor Trade Publishing, 1993. Boyer, Paul S. Salem-Village Witchcraft: A Documentary Record of Local Conflict in Colonial New England. Wadsworth Publishing Co, 1972. Records of Salem Witchcraft: Copied from the Original Documents, Volume 1. W. Elliot Woodward, 1864. Kimball, Henrietta D. Witchcraft Illustrated. Geo A. Kimball, 1892. Mays, Dorothy A. Women In Early America: Struggle, Survival, And Freedom In A New World. ABC-CLIO, Inc, 2004.
this site was amazing it helped me so much on my project thank you !!!!! You’re welcome Kayla! Thank you for visiting the site! My great grandma was Edith May Russell. Doing our family tree I found out Rebecca was my 8th great grandmother. How very terrified she and her sisters must of been. I’m also a descendant of Rebbeca Nurse on my mothers side of the family .. Same! Whats Her Relation To You? She is my ninth great grandmother, I’m 62. She is also my 9th great grandmother. In doing research on my Great-Great Great Grandgfather, Benjamin Nourse Fairbanks, I learned that I am a descendant of Rebecca Towne Nurse (her grandson changed spelling to Nourse and moved to Westborough, MA). Benjamin’s grandmother was Sarah Nourse, great great grandaughter of Rebecca. I am also a descendant. My grandfather Richard Edgar Nourse was my grandfather on my mom’s side. I have a book written in 1930 by Charles Sutherland Tapley all about the family and the trial. And also it gives a list of the descendants from each child. Rebecca(Preston) then had 1715.Charles A Towns of Park Ridge , IL, who is collecting records of the descendants of William and Joanna Blessing Towne, parents of Rebecca Nurse, now has a record of 15,203 descendants of Rebecca Nurse and believes that these are at least 30,000 descendants of this worthy woman. This was taken from the book. This was very helpful, thank you! I would like to ask, though, were her famous words “I can say before my Eternal Father I am innocent and God will clear my innocency” said during her trial or her pre-trial examination? Thanks! I want to visit the house at night or dark hours. It would be more interesting I believe. Rebecca is my 9th great grandma. We were fortunate enough to visit the homestead this Summer. I am also a descendant of Rebecca, very interesting to find out. I once lived in Danvers Mass and of all places on Putnam Street. Two years ago I took my family to see the Nurse home on Pine street. This place has a very earthy smell too it and seemed to always have a hazy cloud hovering above it. The trees are majestic and you could almost go back in time just stand under one. Since my Mother is a “Noyes” her Great x 12 Grandfather was Nicholas Noyes (The Minister giving Sarah her last rites) Its amazing how each one of us have cross over each others path throughout the ages. As a direct descendant of Rebecca Nurse, I appreciate the depiction of her as dignified and the court proceedings as unconscionable. 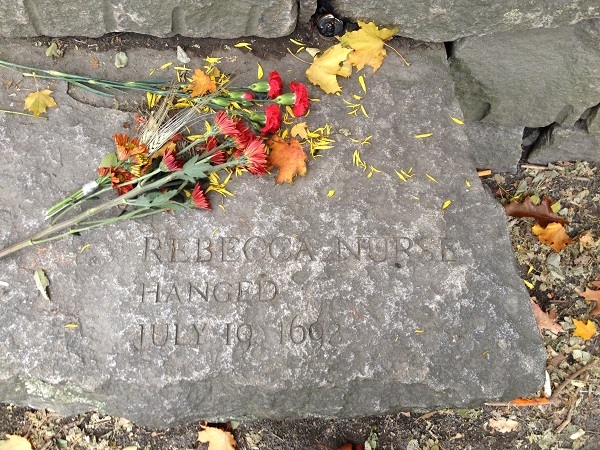 Rebecca Nurse was hanged with my 7th great-grandmother (Susannah ‘North’ Martin). She is my friend’s 9th Great-grandmother which is how I learned they were hanged the same day. I am so appreciative of thorough research of these despicable acts and am beginning to see parallels in our own society. I am hopeful that sharing these historical events with others will prevent the “Putnam’s” of the 21st Century from having the the “Nurse’s” and the “Martin’s” of the world killed. If not, at least good will eventually triumph over evil – 30,000 descendant’s is quite a legacy ; ). A few years ago I learned that I was descended from the Putnam family. Ann Putnam Jr. Is my 2nd cousin 10x removed and Captain John Putnam was my 10 Great Grandfather. I can’t tell you how much horror and shame I have felt knowing what my ancestors did. Today I learned that my boyfriend is the 10 Great Grandson of Rebecca Nurse’s brother Edmund. So over 300 years and half a country away, these two families have shared an almost 20 year friendship that turned into a loving and respectful relationship. This is the most delightful news to me, how God can bring unity to families over the generations. I pray your relationship with your boyfriend is flourishing. My husband is a descendant of Rebecca Nourse. Rebecca Nurse was my 8th great grandmother. I descend from their son Samuel. At some point in the mid 1700’s they migrated to Nova Scotia where i was born. Rebecca’s great granddaughter Elizabeth Nurse married John Putnam’s great grandson Caleb. They are my 5th great grandparents. She was my 9th great grandmother, through Bathsheba Nurse Newton, daughter of Joseph Nurse who fought in the Revolution. Nicholas Noyes the minister who accompanied the accused persons to their deaths, was a distant uncle, as I am descended from his sister Hannah Noyes. Wait Winthrop, one of the Judges was a distant cousin. Rebecca (Towne) Nurse is my 8th great-grandmother through her son Benjamin. This is very, very interesting! Thanks you! Just finding out that Rebecca Nurse is also a grandmother of mine . I believe it the 7th generation. My maiden name is Tracy. In doing my family tree I have found that I am a descendent of Rebecca Nurse. I was shocked to learn of her history. The Salem Witch Trails were something I read about in school, but never knew I would have such close ties to them. I am descended from Rebecca Nurse through her son, Samuel Nurse Sr. through my maternal grandfather (Smith line). I will be taking a trip to Salem this September as a tribute to my beloved 9th great-grandmother. I am a descendent of Rebecca Nurse as well. She is my 10 great grandmother on my mother’s paternal side of the family. This is so interesting! I must tell a story. My dad has been working on our linage for many years now and several years ago he connected us as direct descendants of John and Priscilla Alden (their son John Alden was an accused witch but escaped from prison never to be found). During these years my sisters (3) and I have been asking dad if he has found our “ROYAL” linage yet so we can go to England and claim our rightful place (LOL)? On Ash Wednesday of 2017 I ran into my dad after our respectful services and Mass at Captian D’s restaurant. My mother had told me to ask him about the new linage information, so I did. He said well I have good news and (laughing) bad news. “I found your “ROYAL” connections…….King George I (and should I say, the worst King in history)…..”really dad you couldn’t do better than that?”. He then proceeded to say, “Well then maybe you will find the next bit of news “good” news then. You are the (8? I don’t remember for sure) great granddaughter of Rebecca Towne Nurse, a witch.” (should I say he was laughing at me expression). Then I looked at him and said, “Well I wonder how many people can say that they are “ROYAL WITCHES”?” My two sons just about fell out of their chairs…….it was a good day in my opinion. Rebecca Towne Nourse is my ninth great grandmother on my mother’s side. Mom is Mary Ellen, a very fair shinned, blue eyed redhead (copper) and an extremely pretty lady, mom is an artist. Mary Ellen (mom) is now 81 and doesn’t look her age at all. Mom looks very english, refined. Her mother was Margaret Joy Rahn (maiden name was Rahn). Grandma’s siblings were siblings were Dora, William & Frances (female). Mom or Mary Ellen has two sisters…Shirley and Quincy they all live in California. Rebecca Nurse is my 10th great grandmother. I have always been interested in the Salem Witch Trials… now I know why! What an interesting and in depth article. Thank you! Hi to all you new, and old relatives. So many of us are descendants of Rebecca Nurse. Through my brother, I have learned that we are 6th 7th or 8 generation of her grandchildren through my father who was a Tracy. I’m a descendant if Rebecca Nurse too via her son John and grandson Benjamin Nourse. She’s my 9x great grandma on my maternal grandmother’s side. I’ve known since I was a teenager that I was related to her, but only just connected the dots via family tree recently. Rebecca Nurse is my 8th great grandmother. 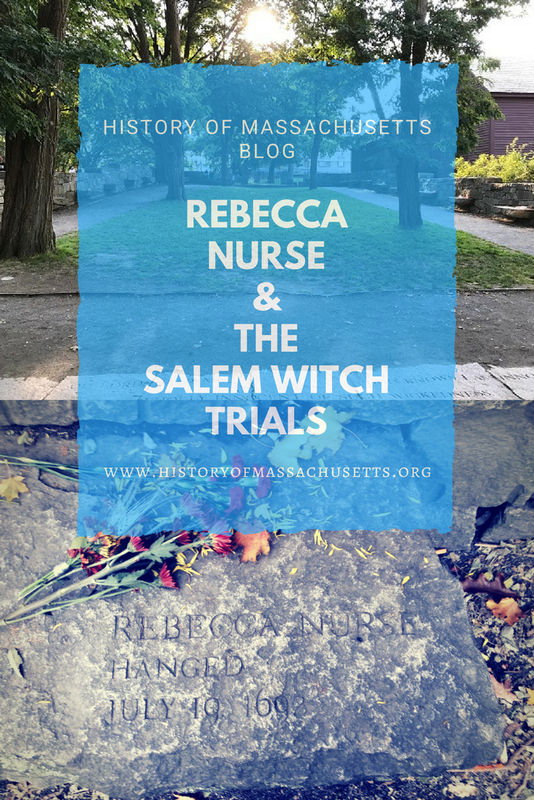 I was lucky enough to be stationed in Natick and took a trip to Salem to visit the site of the trials. Im an 8th grader currently working on my project focused on the Salem Witch trials and your article helped me so much! Thank you!